Home News & Events What Do Rust Prints and Steinway Pianos Have in Common? Two talented GW alumni artists are currently exhibiting at the GW Virginia Science & Technology Campus (VSTC), in Ashburn, Virginia through April 12, with a reception to meet the artists on March 31. While their subject matters, mediums and artistic inspirations are unique, they share a connection to GW. Brian Kirk, a sculptor, artist and art educator, is driven by his curiosity of the natural world, his use of natural materials and learning new art-making processes and techniques. An avid sculptor in stone, metal, clay and mixed media, his unique creations can be found in private and public collections in the area. An alumnus, he received a Bachelor’s of Arts in Fine Arts from GW with an emphasis on ceramics, sculpture and silkscreen, and a Master’s in Interdisciplinary Studies in Studio Art from Virginia Commonwealth University. 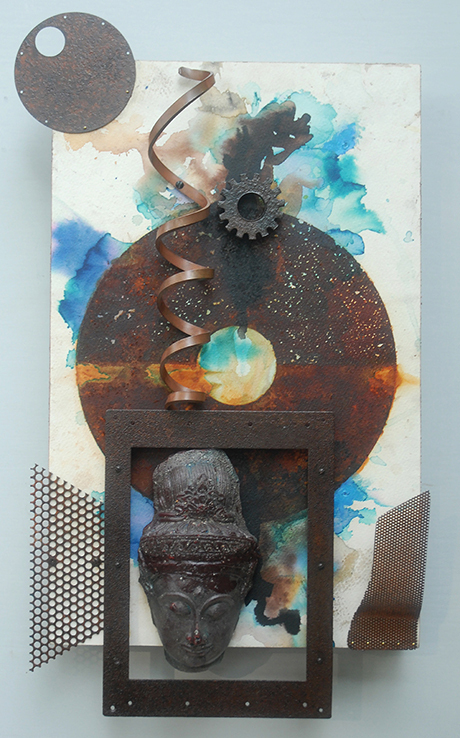 His international experiences in Japan, Mexico, Germany, Belgium, and other parts of Europe have heavily influenced his artwork and given him the opportunity to collect unique objects and re-purpose them in his mixed-media assemblages. Duke, an artist, teacher and native Washingtonian, spent her childhood painting alongside her mother, a talented watercolorist. She later pursued her Bachelor’s of Fine Arts at Boston University and a Master’s of Fine Arts at GW under the tutelage of William Woodward, professor emeritus. She tries to capture a moment in time in her work, using a painting approach known as alla prima to quickly capture a subject and oil paints for their responsiveness. She usually works from life, which she says allows for an essential emotional exchange between artist and subject. She is fascinated by the process of capturing light in her work and finds inspiration in scenery of the Rappahannock Valley, New Mexico and other geographic locations. There are also select still life paintings in the show. “Painting the still life keeps me focused on composition, observational drawing, and I have chosen to paint objects that have been in my possession for quite some time—my family treasures as I like to think of them,” said Duke. The exhibits are free and open to the public in Enterprise Hall, 44983 Knoll Square, Ashburn, VA 20147 through April 12, 2017.